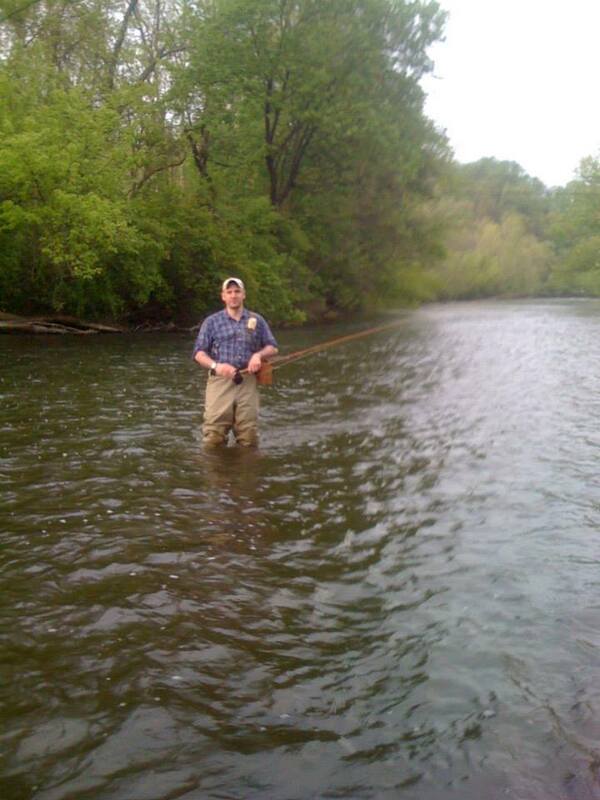 Keystone Fly Guides is a guide service out of South Eastern Pennsylvania and is owned and operated by Derek Eberly. This is our first year of operation and we are proud to have the privilege to serve our clients. We work hard to provide a quality experience that lasts beyond our time on the water. We are currently building our website so in the interim we will be using this blog to update our events. The following is a recent post that I feel perfectly sums up what we are about, where we come from, and where we are headed. 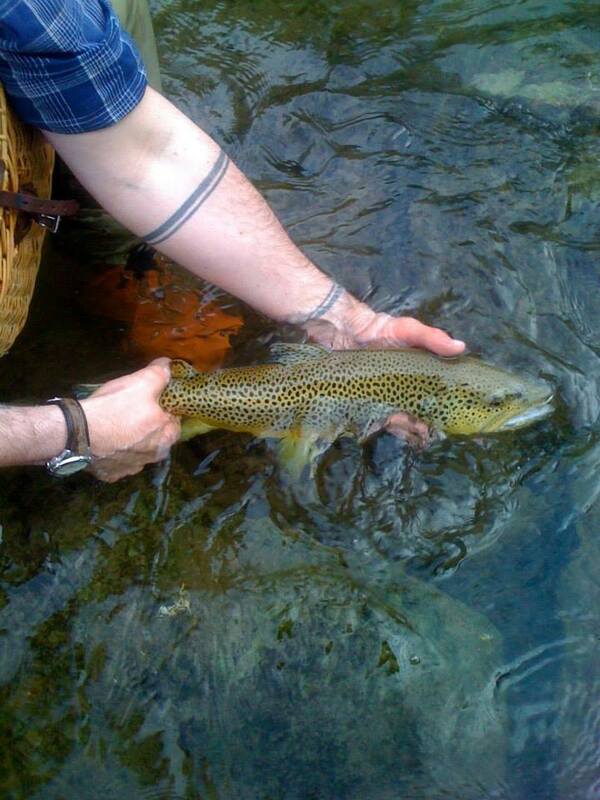 Pete releasing a Tully brown. This year has meant a lot to me. I was first introduced to the sport 13 years ago by my best friend Peter Styer. Pete was a natural born angler and fly caster, I was not. However, we both shared an affinity for being out of doors. Through our friendship and Peter’s patience I learned to fly fish on our local spring creek here in Lancaster. 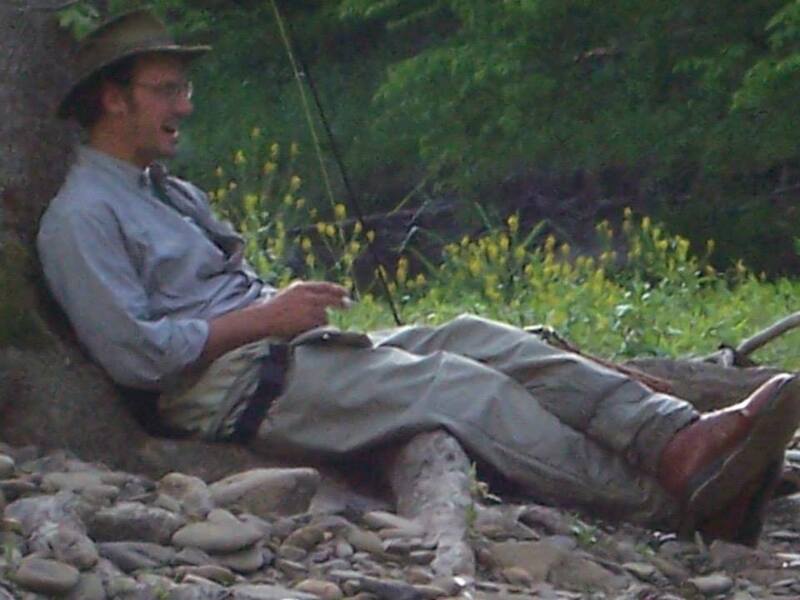 We would spend many years stalking the famous trout streams of northern Pennsylvania together. We once spent an entire week tenting at Leonard Harrison where we fished Pine creek from Galeton to Slate Run. We lived to fish, when he worked for my father’s company we would make sure everything for the week was done by Thursday night so we could leave early Friday to fish all weekend. Peter on the Tulpehocken. One of our favorite places to fish. I was never as good at fishing as Peter was. Sure there were days I caught more fish and sure I would eventually go fishing more often and to more places than he would ever get to. Peter was better at fishing than I will ever be because no matter what, when Peter was fishing he was right there, in that moment. It didn’t matter where I went, I was already thinking about getting a photo or catching this fish or that fish. He never worried about the biggest, or the most or getting the grip and grin. It was just him and the river. Enjoying his time in God’s creation. Peter introduced me to fly fishing and then to my favorite quarry steelhead. My first trip was one day in November right before Thanksgiving. Steven Light, Peter and I loaded into Steven’s old Ford Taurus and did a suicide run to Erie for one day of fishing. We got there around 1am, the motel was closed, we slept in the car at the old bridge over Elk. The next day I struggled, Peter picked up a fish or two during the “magic hour” but the rest of the day was tough. I remember when I almost gave up, I remember letting my line swing through the riffle below me. I watching the line dance around in the rapids back and forth. Almost ready to reel up, call it a day I lifted my rod. I remember the coursing electric feeling of the steelhead as she bent my 5wt Eagle Claw Granger in half. That feeling, is unforgettable. Yet you can never get enough. 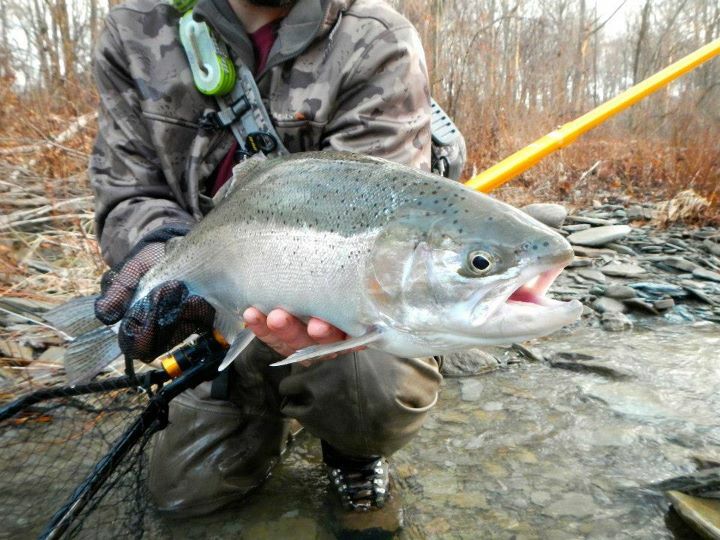 A beautiful Elk Creek hen caught with Erie steelhead guide Patrick Campbell of FOMoutfitters. As addicting as steelhead is that was not the “turning point”. It was after one trip to Tiadaghton when I was practicing casting in his parent’s backyard. There were so many fish during that trip that I just simply could not reach. My presentation was offensive to every trout that had the misfortune of swimming below my cannonball-like cast. His father Jerry must have seen the futile flailing in his backyard and surely took pity on me. He was the first one to get me to “slow down” and let the rod do the work. From that moment forward I have been a student of the cast. 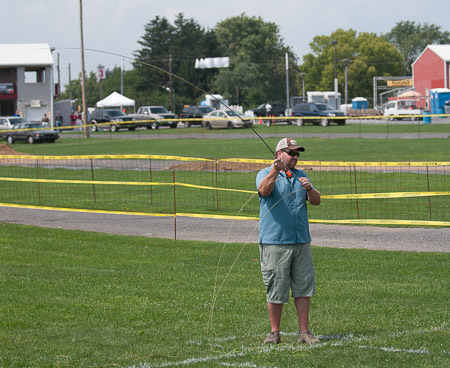 Derek Eberly, (me) owner of Keystone Fly Guides during the distance casting component of the 2014 Pa Casting Championship. I have many fond memories from this journey of fly fishing. One thing I have learned is that you never know who you will affect in life. Peter taught me that. I have done my best to carry that with me everyday. One of the reasons I became a guide and casting instructor is so that I can, in good conscience, pay it forward through the various clinics and classes I help with and direct. Fly tying demonstration with Rick Purnell. 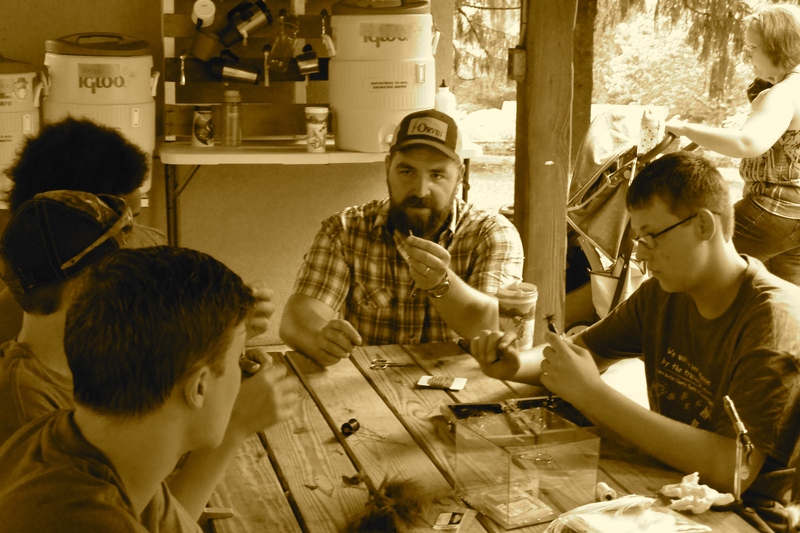 Photo by Josh Slaymaker at the Lancaster County Youth Conservation Camp 2014. I am lucky/blessed/whatever you want to call it, to have had as great a friend as Peter Styer. I know he would be busting my chops right about now so I will stop and digress only to say this: take and enjoy the time you have, whether it is on the stream or elsewhere, it is all we have. Peter was dedicated to helping others in any way that he could. It was through that dedication and commitment that I came to know this wonderful sport. I look forward to sharing my knowledge and passion with others as it was shared with me. Our service honors Peter Styer, without whom I would never have had this much fun. 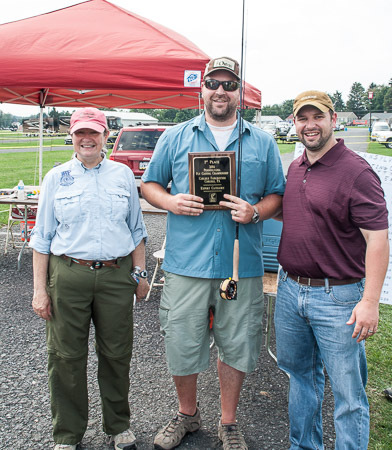 Derek Eberly distance casting at the Pa Fly Casting Championship in Carlisle, Pa 2014.